Day 3 of Revision Week brings us the prolifically funny Bruce Hale, whose three chapter book series keep kids (and The Editor) laughing. When The Editor interviewed him for Revision Week, Bruce was in the thick of revising his second book in the SCHOOL FOR S.P.I.E.S. series: Thicker Than Water. “Revision is in the air!” he declared. Please join Bruce and The Editor as they explore revising series, and find out how to win today’s “Free Partial Edit” from The Editor. 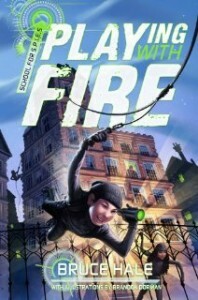 Bruce Hale is the Edgar Award-nominated author-illustrator of nearly 30 funny books for young readers, including the popular Chet Gecko Mysteries, the Underwhere series, and the picture book Snoring Beauty, one of Oprah’s Recommended Reads for Kids. 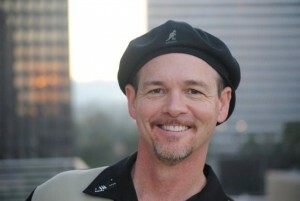 You can find Bruce online at www.brucehale.com or sign up for his fun and insightful e-newsletter of writing tips at www.brucehalewritingtips.com. *After Bruce’s interview are instructions for entering today’s Free Partial Edit Giveaway. How many drafts does it typically take before you feel confident about character and story choices you made for a new story concept? For me, coming up with the first book in a new series is typically a revision-intensive process. I’ve sometimes done as many as five or six drafts before the voice and characters really start to gel. In my newest series, SCHOOL FOR S.P.I.E.S., for example, I did five drafts before I even felt comfortable showing it to author friends and agent for feedback. Once the series is established, things get much easier. I know the characters and I know the voice, so these books take a lot less revision — typically only three or four drafts before I deliver the manuscript (depending on the complexity of the book). At this stage of a series, my revisions focus on different matters: making sure the characters and voice are consistent from book to book; ensuring plenty of variety in the jokes, plot twists, and so forth; and finding ways to keep things familiar but fresh. This varies pretty widely, depending on the book, series, and editor. With CHET GECKO, I would sometimes toss around plot ideas with my editor before I even started the book. With most other series, however, my editor doesn’t come into the process until I have a draft I’m pretty satisfied with — usually #3 or 4. 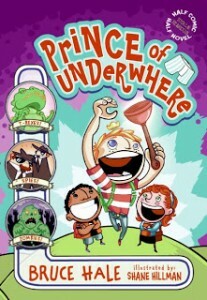 The Underwhere series is your second series. Did the first manuscript fall into place quickly, or did it take a few rounds to settle into the new characters and voices? The UNDERWHERE series was tricky to write, the first book requiring about a year of revision. 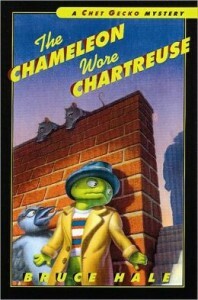 My first challenge was keeping the series’ voice distinct from my CHET GECKO books. Then I had to create characters that were different enough from the ones I’d been writing in my previous series. And finally, I had to learn how to write the comic-book chapters of the story, which required an approach much closer to screenwriting than novel writing. LOTS of revision was involved in that first book, PRINCE OF UNDERWHERE. Although I was part of a critique group years ago, I haven’t been for quite some time. However, I do have writer friends who are kind enough to read and comment on story drafts on an ad-hoc basis, and I do the same for them. My first SCHOOL FOR S.P.I.E.S. book was the first time I’d done that. I gave it to a friend’s daughter who was just slightly older than my target readers, and she gave me some great feedback. I’ve changed the voice from omniscient to first-person, and finally settled on third-person POV. That was pretty drastic, and required TONS of extra revision. But it was worth it, for finding the POV that best suited that story. When I can’t find anything else to tinker with, and I have that general feeling that if I mess with it much more, the entire souffle will collapse in a soggy heap — that’s when I know it’s the final draft. Deadline: MIDNIGHT tonight, March 27, 2013, PST. Winner will be randomly selected using Randomizer.org and announced on March 28, 2013, in the DearEditor.com comments section and on the DearEditor.com Facebook page, and the winner will be notified directly via email. I’m pleased to announce the winner of yesterday’s Free Partial Edit Giveaway: Laurie Weeks, with her manuscript If This World Were Mine. Looking forward to working with you, Laurie! I LOVED this post! Bruce is fantastic! His books rock! Thanks so much for posting! Big congrats to Laurie! 🙂 Thanks to Bruce for sharing his secrets to creating and revising all his series. I love his titles and the covers! Making children laugh is a great gift. Wishing Bruce much success! Great post from Bruce. Thanks! My kids and I adored Bruce’s Chet Gecko series…they are hilarious!! Thank you for sharing his insights (and Laura’s from yesterday too), Deborah!. Love the soggy souffle image! This is my favorite interview so far. Thank you! And Bruce will be at our Oregon SCBWI Spring conference! That’s worth the price of admission right there. I look forward to learning a lot about writing humor (which I take a stab at) from him. Thanks for the post! I am nearing the stage of a collapsing souffle. I’d better let my ms sit for a while. Thank you, Bruce and The Editor. Congrats, Laurie on the win! A pinch of drastic and the recipe was just right!